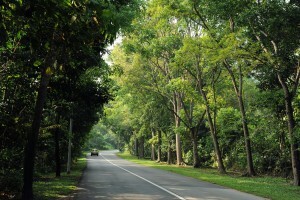 Lim Chu Kang Road | JustRunLah! Run along this tranquil outback as you take in the old kampong ambience and lush greenery that line its rural roads. Go on a journey back in time as you cruise the historical Lim Chu Kang Road. Built before the 1900s to serve the gambier, pepper and rubber plantations dotting the north-western countryside, the road became the main connection between the villages and the city-bound roads of Choa Chu Kang and Bukit Timah. While the old attap and zinc-roofed homes are no longer present, the same mature trees still provide shelter along this beautiful road today. This is a relatively straight route with limited pedestrian pavement. As you will mostly be running on the roads, take the path on the side of the oncoming traffic, and be careful of cars and cyclists when you are running.